It is the eighteenth century and the skies darken over England. That’s not a metaphor for anything, nor is it talking about the typical English weather. The Industrial Revolution has begun and coal smoke blackens the air and lungs of England. The original Brass turned ten years old last year, but the game by Martin Wallace still holds a proud overall rank 24 on BoardGameGeek at the time of writing. Not bad in a time where new games are so numerous that many won’t even be remembered ten years from now. Two new editions by Roxley are a great opportunity for us to review this modern classic. 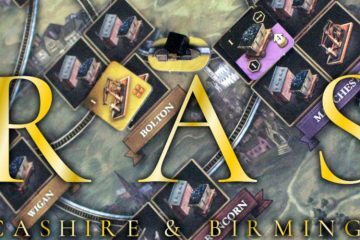 Technically it’s Brass: Lancashire that is a new edition of the original Brass, Brass: Birmingham is more like a spin-off. However, the two games are so similar in rules and theme that we decided to put them in one review and highlight the differences.